I created an excel file for Purchase Orders that feeds into a different tab in such format that aligns with the PO Entry module in Great Plains. 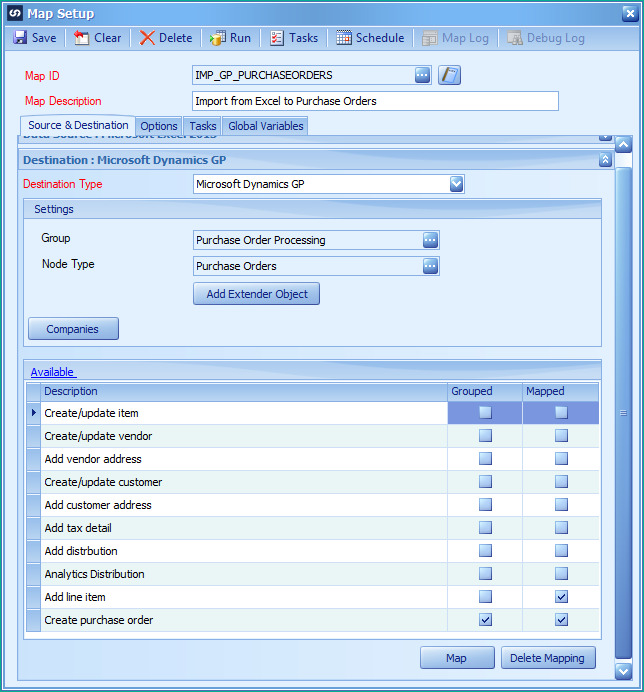 I am unfamiliar with how to use Integration Manager software to map out the PO Upload process whereby multiple PO's can be uploaded to GP through a CSV file. You must use eConnect to import purchase orders. If you do, you're in luck, as there is a sample purchase order import. 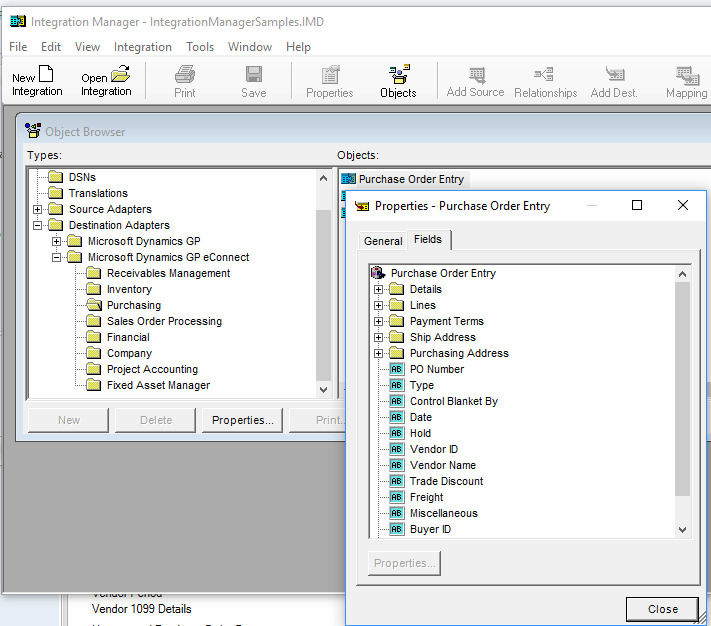 Click Open Integration, then look for POP Transaction in the list. You can use the sample sources as a template for how your CSV files should be formatted, as well as see how the mapping is done from the sources. If you need help doing this, or have needs outside of the sample, feel free to ask. Hi Sarah, thank you for your input. I am being told that we do not have eConnect but we are installing SmartConnect, which I believe is produced by the same company. Is it possible to use SmartConnect to complete the PO Upload? Both SmartConnect and eConnect are eOne products. SmartConnect leverages eConnect functionality and wraps it in a more user-friendly interface providing more or less drag and drop integration development, sort of like the Scribe UI. I think she was referring to the eConnect destination adapters inside normal Integration Manager. SmartConnect will do the same with more bells and whistles such as easy scheduling of the integrations. That's a resounding YES - and in my opinion SmartConnect is the way to go for any type of integration. It is difficult to write out all of the instructions for this without seeing your source data nor knowing other functionality you use -like are items inventory or not, etc. If you download their sample maps it will also give you a good idea on how to set this up.